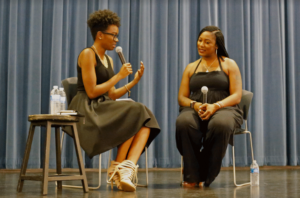 Tiffany Dena Loftin facilitates a discussion with Alicia Garza at Radical Voices on Tuesday at the Stevenson Event Center. 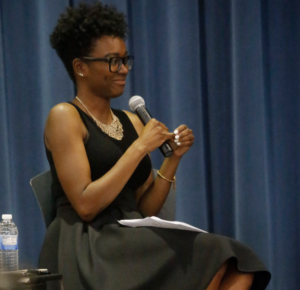 Garza, co-founder of Black Lives Matter, spoke about politics, identity and the media. Loftin is a former commissioner for former President Obama and current racial justice coordinator for the Civil, Human and Women’s Rights Department at the American Federation of Labor and Congress of Industrial Organizations. The event was held to equip people with tools to combat white supremacy and racism within the current political climate and mainstream media. Photo by Cal Tobias. #BlackLivesMatter has transformed over the last four years from a hashtag to a movement. 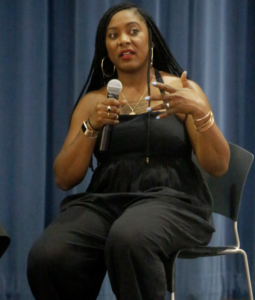 Its co-founder, Alicia Garza, returned to UC Santa Cruz on May 9 to speak about politics, identity and the media for the second annual Radical Voices event. Tuesday night the Stevenson Event Center was filled to capacity with nearly 400 attendees waiting to hear Garza’s keynote speech, which was followed by a Q&A led by UCSC alumna Tiffany Dena Loftin. Garza had previously been the keynote of UCSC’s Annual Martin Luther King Jr. Memorial Convocation in March 2016. Radical Voices was organized by Student Media, Engaging Education, UCSC’s Campus Sustainability Council, the Afrikan/Black Student Alliance, the Student Union Governance Board and Movimiento Estudiantil Chicanx de Aztlán. The mission of the event is to redefine the way media has classically reported on underrepresented communities and social justice movements. Garza co-founded the Black Lives Matter movement in an effort to push back on the oppressive state Black people live under globally. She advocates for others to take leadership and initiative and be brave enough to educate others on issues that affect the well-being of humans and the environment. The Black Lives Matter movement serves as a support system for Black people while acknowledging and embracing the intersectionality of identities. Though Garza started from humble beginnings, she has now created a way for Black people to fight for their liberation worldwide. Loftin, the emcee and host for the event, was Student Union Assembly (SUA) president during her senior year at UCSC and was involved in other spaces, including Rainbow Theater. She was also involved in the Real Pain, Real Action and Black Lives Matter movements on campus and collaborated to demand on-campus housing for Black students. In doing so, Loftin founded the Rosa Parks African American Theme House (R.PAATH) at Stevenson College. Following her UCSC career, she was appointed the commissioner to the White House Initiative on Educational Excellence for African Americans by former President Barack Obama. Tiffany Dena Loftin: What is the role of student activism in movements like these? TDL: What are some of the next steps politically for [white folks] to show up as allies for the work that’s being done across the country, more specifically in California and Santa Cruz? AG: “I don’t like the word ‘ally,’ man. That doesn’t say nothing, that doesn’t mean anything. Like, let’s do some stuff together. Cause I can be an ally to you and do absolutely nothing. Let’s conspire together, let’s collaborate, let’s be co-conspirators. Here’s how you can do that. “One: get out of your own head […] You are going to mess up, I guarantee you’re going to mess up, you’re going to say the wrong thing. It’s fine, it’s okay, you’re going to make a million of those [mistakes]. Don’t let that stop you from being present. TDL: How do you manage media? how do you navigate media? You’ve talked a lot about being intentional with the spaces you operate, can you share with folks how you operate with media? CHP: Why are Radical Voices and programs like it important for student outreach and engagement? CHP: Would you consider yours a “Radical Voice”? CHP: How has your identity impacted your career, if it has? “When I got to D.C., I had to do the exact same thing and all the meetings that I go to, all the managers, all the top, top, top people have been white people. So being someone who is qualified, intelligent, trained, experienced, creative, innovative and gets the work done, being a young Black woman like me and also being in spaces like that — it is very difficult sometimes, and it’s very upsetting sometimes because we don’t always win.